Can Arsenal challenge the top two this season? | Photo: Kunjan Malde Photography. The WSL starts again this weekend as Arsenal take on Liverpool in their first game. The 2018/19 season sees a change to the league structure in the women's game. There's a fancy new modern logo. There are new teams and of course new players. But will we see a new Arsenal? This will be the sixth season in a row in which Arsenal haven't competed in the UEFA Women's Champions League. It's also been seven season's since the club last won the league. Arsenal has a rich history in the women's game, the best in English football. They've been steadily adding to their large trophy cabinet with domestic cup successes in recent years, but the real ambition is surely to go beyond that. Joe Montemurro has plenty to build upon going into the new league season but can they finally break the grasp Manchester City and Chelsea have over the WSL? Time will tell. In 2017/18 Arsenal's season got off to a slow start. Pedro Martinez Losa lost heavily to Man City and then drew with Bristol City, results that saw him leave his post. Montemurro was then appointed in November 2017 and after suffering defeat against Chelsea in his second game went on a remarkable 13 match unbeaten streak in the new year. It was a series of games which saw Arsenal finish one point behind Man City, missing out on Champions League football by the slimmest of margins. Arsenal peaked well, but it was the slow start and injuries that ultimately meant they had to settle for third place. A quick start will, therefore, be something they'll be extremely keen to do when the new WSL season kicks off this weekend. They face Liverpool in their opening fixture, a match which could be tricky, before facing Yeovil and then West Ham. Arsenal have added to their defensive and midfield ranks by signings four players during the off season. Two of their new acquisitions have arrived from Turbine Potsdam as German and Swiss pair Tabea Kemme and Lia Walti look to add more steel to the squad. The former is currently injured but is expected to return to training in the not too distant future. Walti has meanwhile been a prominent figure throughout pre-season and will bring experience to the Arsenal midfield. Viki Schnaderbeck also joined the club after over a decade at Bayern Munich but unfortunately will sit out until Christmas after undergoing knee surgery in August. Her period on the sidelines, together with Kemme's injury continues a bizarre trend at Arsenal of new signings getting injured. Vivianne Miedema spent a period out through injury last season, whilst there were long-term injuries for Kim Little on her return and for Jessica Samuelsson after she arrived in North London. There is good news for Arsenal though with Little coming back fully towards the end of last season whilst Samuelsson returned in pre-season. The club also brought in French goalkeeper Pauline Peyraud-Magnin over the summer. She joins from Lyon as a replacement for Anna Moorhouse after she departed for West Ham. The obvious factor for Arsenal is merely keeping players fit. If they can do that then there should be a noticeable improvement. Schnaderbeck being out for a long period of time is a blow but the midfield area is one which possesses great quality anyway. Little returning will be huge for Montemurro who will be keen for an extra creative edge this season. Scoring more goals is an area the Gunners will need to improve on. They scored six less than WSL winners Chelsea last season whilst they were 13 behind Man City. If they are to have any chance of getting back in the top two then putting the ball in the net more is an obvious requirement. More goals should come this term, that's providing Miedema stays fit. Beth Mead was excellent towards the back end of last season and that rewarded her with her first England caps. She will only get better in 2018, whilst Little will provide both goals and assists. It's also hard to ignore the importance of Danielle Carter and Danielle van de Donk in forward areas too. There is plenty of quality in attack so surely more goals is something to expect from this Arsenal team. Playing players in their favoured positions will also be something Montemurro will be keen to do. Injuries and differing tactics at times have led to a number of the Arsenal squad playing out of position in recent years but the Gunners' form in the final months of 2017/18 suggests they're getting things right in that regard. You may be wondering how you've got this far into an Arsenal preview without reading a single word about Jordan Nobbs. She is without a doubt one of Montemurro's key players and will be pivotal to any success the Gunners have. Her control of the game in midfield is one of the best in English football and she has the capability to score some truly wonderful goals. Miedema will of course also be vital. Keep her fit and Arsenal have a genuine chance this season. Her first term in England was stop-start without really showing her true colours but she is someone you can expect a healthy return from. Leah Williamson, perhaps a slight wild card choice, will be another important player for Arsenal this season. She established herself in defence last season and like Mead, has earned herself her first England cap in 2018. It's almost impossible to tell with Arsenal. Whether it be the men's or women's team, they have the potential to either surprise or fail to live up to expectations. At the beginning of last season, it was thought the Gunners would be up there in terms of returning to the Champions League and ahead of this campaign the same can be said again. 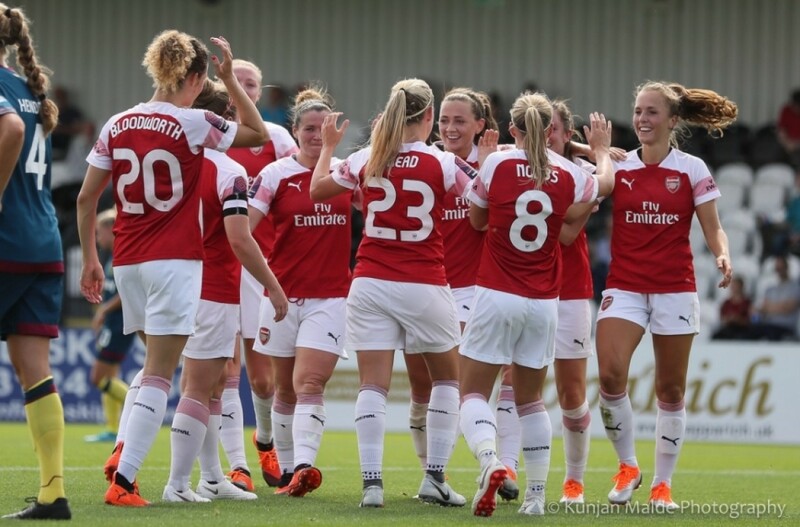 It's far from an easy task to take on the likes of Chelsea and Man City, but with the players Arsenal have at their disposal and with returning absentees, there could be a trio of teams challenging for the WSL in 2018/19, rather than it being a two horse race. One thing you can probably be certain to expect is that Arsenal will somehow find a way to make it difficult for themselves.